We offer a great selection of redemption games to choose from. To learn more visit the manufacturer websites below. 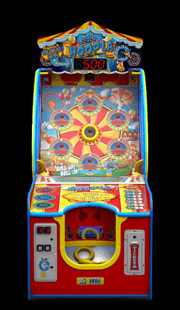 Designed for all ages, this carnival redemption game is perfect for all ages. Make three bags in a row on the same color hole and youâ€™re on a streakâ€”equal to 5,000 points! 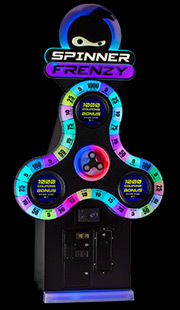 Players use a "whimsical hoop" to hook all 7 LED lite pegs within the allotted time to reach the bonus round. 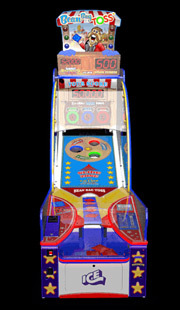 A player can win the MEGA bonus round by hooking one hoop on the only lit bonus peg. 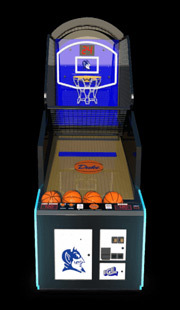 With deluxe custom marquee options available, choose from 32 NBA teams to decorate your NBA Game Time. 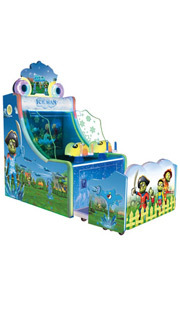 Perfect for any arcade, game room or family entertainment center! 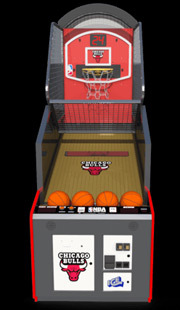 In this new mid-sized version of the ever-durable street game NBA Hoops, NBA Game Time boasts the latest technology such as new LED lighting, slam dunk sound effects, moving hoop, and more. See how many points you can rack up against the ticking clock!